What are some common-sense measures you can take? With people in, out and around your inventory, it's difficult to protect it from pilferage...but there are ways. Retailers have long understood that they have more to fear from dishonest employees than they do shoplifters. In 2002, retailers lost over $15 billion to employee theft and fraud. For your warehouse, the losses are almost entirely internal; there are no customers to shoplift, and external thieves often work with an employee to gain access or information. 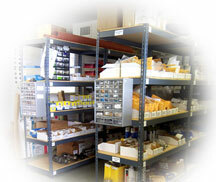 The threat to your inventory and profitability is significant. It costs you in lost inventory, higher insurance premiums, and personnel turnover. A recent study at the University of Florida reveals that security managers attribute more than 48 percent of theft to employees. It starts with hiring the right people—which is easier said than done. You can reduce your risks with personnel steps like checking references and backgrounds of your applicants. Look for felony records, especially for those you’re going to trust with access to areas with highly desirable inventory. Even mundane inventory will be pilfered at surprisingly high rates if you have the wrong people in place. Equipment solutions are possible, as well. You can look at such items as security mirrors that give you visibility into closed areas, around corners, and into hallways. Wire Partitions and Security Cages will tightly control access. You can also limit access to an area with Folding Security Gates, if you need flexibility and door coverage. Lockable wire cabinets and lockers can provide pilferage deterrence and protection in the right situation. There are other products that can lock a pallet rack bay or a shelving unit down, allowing you to combine security and storage into the same process. Security-focused storage equipment is not the sole answer, of course, but its role is often understated. Look toward your inventory monitoring processes to also provide some relief. If you know what inventory you have and what you’re supposed to have at any given point, identifying a source of theft is much easier. If it goes on for weeks or months before you know about it, the damage has already been done and you probably won’t recoup the losses. It’s best to check early and often. For extreme cases, there are companies that specialize in undercover operations and surveillance. You can find many of them by searching Google or Yahoo under the term “warehouse security system”. Often, they will discover problems that undermine productivity as well as pilferage. For instance, Florida-based Internal Intelligence International discovered a significant illegal drug selling operation in the plant of one of its clients. This is an extreme measure, but if you need it, you need it. Sufficient monitoring systems should be considered for high-risk areas, too. Camera and surveillance systems are good, but something as simple and inexpensive as unscheduled walk-throughs are very effective theft deterrents. Unpredictability is the key. Your information should be timely, but your walk throughs in the warehouse should be something that you do frequently and without a fixed schedule. Watch your loading docks and platforms—they’re very easy places for a thief to remove stolen property, often in partnership with an outsider. Your security system is typically designed to protect your facility from outside thieves. How much emphasis does it put on employee theft? The U.S. Customs department has published warehouse security information for companies dealing with Customs issues on its website. Many of its recommendations are common sense, and apply to general warehousing as well as customs specific operations. One common-sense recommendation is that you separate shipping docks from employee parking lots, making it much more difficult to remove items from the warehouse. No single thing will reduce theft, but a combination of processes, hiring standards, security systems, and equipment can combine to help you improve your operation and eliminate losses associated with internal inventory pilferage.